Oligomenorrhea, or infrequent and irregular period, is said to be present when a period cycle occurs so infrequently that there is usually a total of four to nine menstrual cycles in a year. This condition is either caused by pituitary tumors that lead to falling estrogen and rising prolactin levels, or it develops as a side-effect of Polycystic Ovarian Syndrome (PCOS). Oligomenorrhea is one of the leading causes of female infertility. 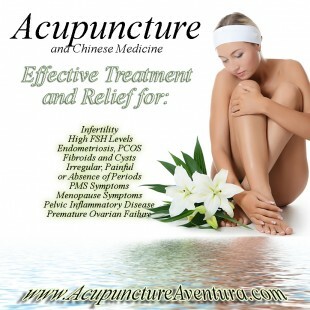 If you are tired of never knowing when your period is going to start, and are determined to get your body back to optimal health, along with increasing your chances of pregnancy; you may want to consider alternative medicine in the form of acupuncture as a safe and healthy method of managing your condition. Usually, when Oligomenorrhea is diagnosed in female athletes, they are asked to cut back on their fitness routine and reduce their amount of physical activity. For an athlete whose entire life and livelihood depends on exercise, this is rather unfair. It also means that male athletes will get an undeserved advantage due to extra training time. For non-athletes, doctors usually prescribe oral contraceptives, such as birth control pills. All these do is flood your body with chemicals that stay in your bloodstream and create a toxic environment for you and your future baby. They also alter your hormonal make-up, which upsets the natural balance, and induces side-effects which are uncomfortable, inconvenient, and painful. These pills, chemicals, and hormones offer a temporary solution to a permanent problem, and you will have to administer these drugs to help you manage the condition throughout your reproductive life. This is why more and more women are opting for an alternative solution, and trying acupuncture therapy. When compared to chemical or surgical intervention, acupuncture is a safe, healthy, and non-invasive method for effectively treating your condition. Acupuncture allows for energy to pass the main meridians and pathways of the body, allowing it to release endorphins and other hormones associated with healing. This energy is referred to as qi, and in Chinese medicine, it is believed that blood is the material manifestation of qi. When a woman does not menstruate as she is supposed to, it is believed that her qi is not flowing smoothly. Acupuncture allows for blood to flow smoothly, and as it goes to the ovaries, it relieves the area of cysts and other abnormalities. All this means is that acupuncture can help manage Oligomenorrhea without pumping the body full of unnecessary chemicals. At our center in Aventura Florida, we believe in a combination of eastern and western medicine to help you receive the best of both worlds. Acupuncture therapy has no adverse effects for your body, and can help maintain perfect reproductive health. To make an appointment, call us at (786) 537-7022 and we can begin your treatment immediately.